Brand comparisons are a great way of learning more about different brands and helping you to decide which one would be the better choice for your next purchase. We have numerous brand comparisons over here on our site and today we will add another to that collection. 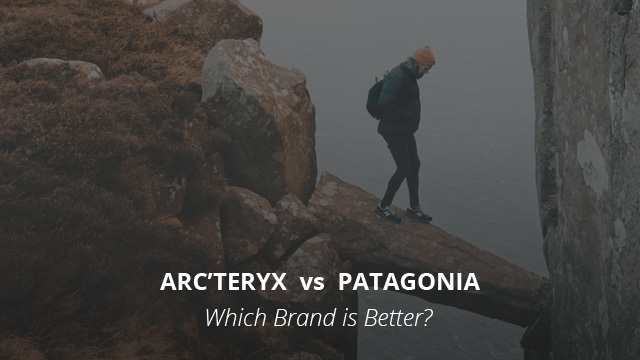 Today we will take a look at Arc’teryx and Patagonia, two brands that are quite similar in regards to the type of products they manufacture and the reputation they hold. They are two of the most beloved and recommended brands by outdoors’ enthusiasts and it’s finally time for us to see why that is and how they compare. Arc’teryx is a Canadian brand founded in 1991 in North Vancouver, British Columbia, by Dave Lane. The name of the brand refers to evolution, which is also visible in the brand’s logo, the Archaeopteryx, one of the earliest known birds. What does evolution and an outdoor sports brand have in common? Their constant change and adaptation to the environment! Arc’teryx is one of those brands that are constantly bringing innovative designs to the outdoor sports market, be it in clothing or gear. The brand’s two most popular products are the Bora backpack and the Vapor harness, which were both made using thermolamination technology. They are some of the earliest products by Arc’teryx, which originally manufactured mainly climbing gear. After obtaining the Gore-Tex license, Arc’teryx began to really establish itself as one of the leading brands in outdoor clothing. That reputation is still held strong to this day. As with many other major brands, Arc’teryx uses only high quality raw materials and fabrics, which not only provide the best performance but are also very long lasting and durable. These are all Bluesign® certified materials, meaning that they are free of harmful elements and safe for humans and the environment. Speaking of which, Arc’teryx is one of those brands that are not solely mindful of the quality of their products but also the quality of their manufacturing. They have made great strides in ensuring that the manufacturing process is ethically done not just in regards to its workers’ treatment, facilities and working conditions, but also in the aftermath of its environmental impact. Brands that place a great focus on the environment play an important role in ensuring that the products we purchase are not coming at a high natural cost. In this regard, Arc’teryx makes sure to use materials that are fully traceable and free of harmful chemicals, the animals which the raw natural materials are sourced from, are humanely treated, and that the finished product lasts for many years, thus lowering the amount of re-manufacturing. Apart from Polyester and Nylon, which are the staples of outdoor clothing, they also use the Gore-Tex technology for their waterproof pieces, as well as the AC2 technology that can be found in their backpacks. We have picked two designs by Arc’teryx, the first of which is the Thorium AR Hoody for men. This is a hooded jacket made of 100% Nylon and lined with Polyester on the inside. 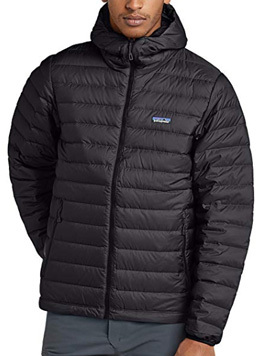 It is an insulated technical down jacket, with 90% duck down and 10% feather filling. The quilting is horizontal and it helps hold the insulation in place, which covers the body and the sleeves. It comes with a drop-tail hem and elasticized sleeve cuffs. Our second pick is the Beta SL jacket for women. This is a 100% Nylon jacket, really lightweight and highly packable, making it not just comfortable but also travel-friendly. It is made of a Gore-Tex shell that gives the jacket both waterproof and windproof qualities, as well as making it highly breathable. It comes with a hooded collar and in a very slim-fit cut, making it a great sports jacket. 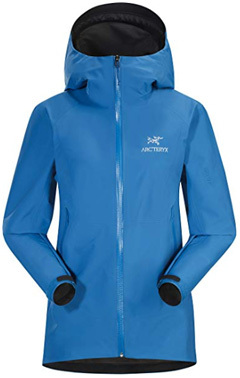 Arc’teryx jackets and products come in varying prices, some more affordable than others. However, it is not the most wallet-friendly brand out there. Their designs average at around $200 and many go above that. Are their jackets worth the price? Definitely! The quality is great and the performance is also impressive. Patagonia is a brand that we frequently feature in our selections, reviews and comparisons, and for good reason. It is a brand that you will find as suggested all over the internet and the products of which come with stellar reviews. Its story begins with Chouinard Equipment, a Californian brand that went on to split, creating two new brands, one of which was Patagonia, officially established in 1973. Unlike other brands, including Arc’teryx, Patagonia was a clothing brand ever since it first started out and has expanded its product range through the years. It is also renowned for its efforts at minimizing environmental impact, which we will see in a minute. Patagonia’s raw materials and fabrics are mainly sourced through recycling, whereas those that cannot be so are sourced ethically and sustainably, meeting all the required standards. Primarily using Polyester and Nylon, Patagonia also use different fabric technologies, including Gore-Tex. We must mention, however, the brand’s very own developed technology, the H2No, which we have previously compared to Gore-Tex. This is a high-performance fabric that is both waterproof and highly breathable, tested through an extensive and rigorous process, the 24 Killer Wash testing process that puts the fabrics through the worst conditions and which guarantees that the fabrics that pass successfully are of the highest quality. When looking at the environmental considerations, Patagonia stays away from harsh chemicals that are not biodegradable and which harm nature. One of the products used is the Deluge® Coating, a safer and long lasting water repellent product that requires less applications and is gentler. The products manufactured by the brand are long-lasting and very durable, meaning less re-manufacturing and less harm to the environment. The Down Sweater Hoodie for men is our first choice from Patagonia for this comparison. This is a Polyester jacket made of recycled Ripstop polyester fabric and treated with DWR coating to ensure it’s weather-resistant. It comes with an attached hood and elasticized sleeve cuffs, as well as two hand warmer pockets on the sides. 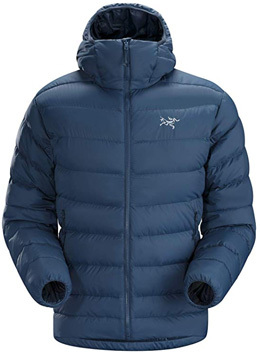 It is insulated with 800 fill power goose down, which is evenly distributed on the body and sleeves. The design for women is the Houdini jacket, a lightweight and water-resistant design that is made of 100% Ripstop Nylon fabric. It is a hooded jacket which comes with elasticized cuffs and an adjustable, drop-tail hem. This is a packable jacket that packs into its own chest pocket and it also comes with reflective logos for visibility. When it comes to price, Patagonia provides options that are somewhat affordable, but overall this is not the most affordable brand you will come across. 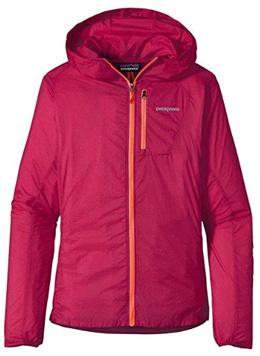 Well, if you are looking for a product that you won’t have to repurchase with each season, then Patagonia jackets are definitely worth the price as they are very well made and perform beautifully. If you are interested to know more as to why these products are so expensive, head over to this piece of ours. The answer to this question is quite tricky for today’s piece. We sided with Arc’teryx when we compared it to Canada Goose and Marmot, but today it’s not that straightforward. These are very similar brands in how well their products perform. It’s difficult to go wrong with a jacket from either brand. Thus, which one is better? They are both great brands for technical outdoor clothing. They both use Gore-Tex and Patagonia’s H2No technology performs impressively, thus it’s hard to be disappointed when looking for weatherproof shells. In regards to breathable options, they both offer a multitude of jackets that perform effortlessly, therefore it’s a matter of how much you are willing to spend and which style you like better. Previous Article← Ski Jacket vs Winter Jacket: What’s the Difference?